➤ Upon arrival, you will be welcomed by our representative and take your Airport Shuttle Coach to transfer to your hotel for check in. ➤ After breakfast, join your SIC tour to Sea World ~ the coastal strip's oldest theme park, having been started in 1958 as Surfers Paradise Ski Gardens at Carrara and later renamed and relocated to Sea World Drive in 1971. ➤ It includes rides, animal exhibits and other attractions, and promotes conservation through education and through the rescue and rehabilitation of sick, injured or orphaned wildlife. ➤ It is also firmly committed to marine research and rescue, and a place where visitors can learn about and make contact with a variety of marine animals. Be dazzled and amazed with the delightful dolphins, speedy penguins and the fearsome shark. ➤ After breakfast, transfer to Paradise Country Farm. It is a great destination for families to experience an authentic Aussie Farm that reflects the traditional Australian Bush Culture on the Gold Coast. There is so much to do, you can feed the friendly kangaroos, visit Koala Village where you can have your photo taken with a cuddly Koala, see the skills of the master shearers in the Sheep Shearing Show and Ram Parade. ➤ A BBQ Lunch will be served at Farm. After lunch, transfer to Harbor Town for Shopping. Harbor Town Gold Coast was the first and largest purpose built, brand direct outlet shopping centre in Australia and still remains so today. ➤ After breakfast, join your SIC tour to Movie World It is owned and operated by Village Roadshow since the take over from Time Warner and is the only movie related park in Australia. It opened on 3 June 1991. ➤ The park contains various movie-themed rides and attractions ranging from motion simulators to roller coasters and slow river rides. In addition, costumed character performers also patrol the park, allowing visitors the chance to take photos with them. These include Batman, Austin Powers, Marilyn Monroe, Scooby Doo, The Mystery Inc. Gang and various Looney Tunes characters. Minor street shows including skits and singing performances are also present. The All-Star Parade showcases costumed characters alongside vehicles and movie-themed floats. ➤ After breakfast, you are free to explore on your own. You will then be transferred to the airport for your flight to Sydney. ➤ After breakfast, join your SIC Tour around Sydney. ➤ En Route - Your Driver Guide will provide expert commentary as you weave your way through the beautiful northern beach suburbs of Sydney. ➤ Harbour Bridge - You’ll head out over the Sydney Harbour Bridge, one of the largest steel arch bridges in the world. Its arch-based design has led to it being known to locals as ‘the Coathanger’. Designed in 1924 to connect the northern and southern shores of this growing city, the Harbour Bridge opened in 1932 and is one of the city’s most photographed icons. ➤ Just a few kilometres from Sydney city on the lower North Shore is Milsons Point. One of Sydney’s more affluent suburbs, the streets are filled with beautiful homes, churches and schools, many built in the late 1800s. With its incredible views of the harbour and Opera House, and an abundance of leading restaurants, cafés and boutique shops, Milsons Point is a popular destination for both locals and visitors. ➤ From Milsons Point you’ll get a fantastic view of the iconic Sydney Opera House. This World Heritage listed building designed by Jørn Utzon is considered a masterpiece of modern architecture and a world class performing arts venue. Make sure you have your camera ready, as views of the Opera House don’t get any better than this! ➤ The heath-covered clifftops at North Head reveal uninterrupted Pacific Ocean views and a spectacular panorama of the harbour and Sydney skyline. ➤ Time to feel the sand between your toes! The exciting suburb of Manly is famous for its beaches that stretch from Queenscliff up to the North Steyne Beach to Manly Beach. With its relaxed, outdoor lifestyle, Manly is a great place to take some time wandering on the beaches and checking out the sights. You might also like to take in some of the local sights and treat yourself to morning tea in one of the many cafés (own expense). ➤ En Route- Your Driver Guide will provide expert commentary as you weave through the city streets to key landmarks. ➤ At the very base of the Harbour Bridge is the historic Rocks district. Featuring heritage-listed buildings and streetscapes, The Rocks is popular for its markets, cafés, boutique shops and spectacular harbour views. The area was inhabited by the indigenous Gadigal people, before the first European settlers claimed the land in 1788. Your Driver Guide will share stories, both tall and true, of the characters and events that shaped this port community. ➤ Mrs. Macquarie's Chair - High on the peninsula known as Mrs. Macquarie’s Point, the lookout was named after Mrs. Macquarie, the wife of a New South Wales Governor, known to visit the area in the early 1800s. From her convict-built sandstone ‘chair’, enjoy birds-eye views of the Sydney Opera House, a masterpiece of modern architecture and a world class arts venue. ➤ From Mrs. Macquarie’s Chair you’ll get another birds-eye view of the Sydney Opera House, arguably the most recognisable icon in the world. This World Heritage listed building is considered a masterpiece of late modern architecture and a world class performing arts venue. ➤ Have your camera ready! You’re now heading to the entrance of Sydney Harbour, known as the Gap. A dramatic ocean cliff on the coast, the Gap will give you breathtaking views of the coastline. ➤ Australians are renowned for their relaxed and outdoor lifestyle and Bondi Beach is a prime example of this. One of the most famous beaches in the world, it is a captivating location brimming with lifeguards, surfers and tanned beach-goers. You can wander along the shoreline and dip your toes into the cool ocean or treat yourself to afternoon tea (own expense) from one of the many cosmopolitan cafés and restaurants. ➤ After breakfast, join your SIC tour to Blue Mountains and Wildlife Experience including cruise. 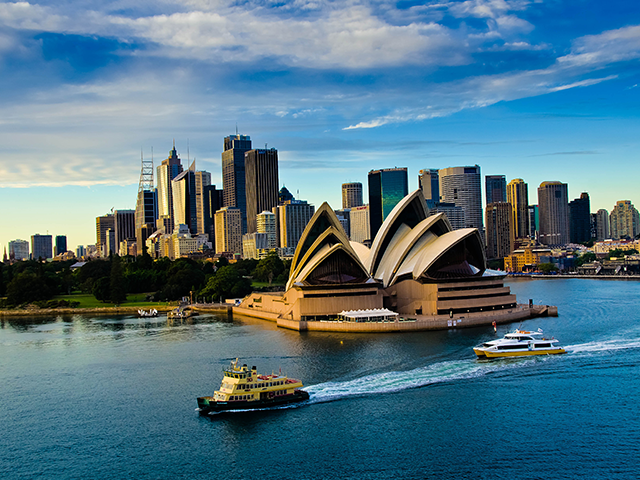 Start the tour by traveling over the iconic Sydney Harbour Bridge. ➤ Discover the spectacular Blue Mountains and see native wildlife whilst you explore World Heritage Blue Mountains National Park. This rugged and beautiful region forms part of the Great Dividing Range, linking tropical north to temperate south, while dividing coastal cities from the vast Outback. ➤ See Katoomba – the resort region capital of the Blue Mountains & Enjoy breathtaking views over the Jamison Valley. ➤ Next, discover Leura Village, a delightful blend of groomed gardens and quaint shops, enjoy free time to wander the streets of Leura. ➤ Arrive at Scenic World and join the optional Blue Mountains Rides - Scenic Railway, Cableway or Skyway (own expense). You can ride the steepest incline Railway in the world down to a lush and hidden valley below. Or gently ascend on the Cableway taking in panoramic views and ride on the Skyway which glides between cliff tops 270 metres above ancient ravines and the rainforest canopy. These rides are a great way to see the steep valleys, canyons and Three Sisters rock formation. ➤ OR you can walk on the valley floor boardwalk under a canopy of tall tree ferns. ➤ Next, embark on a unique local experience at Featherdale Wildlife Park which has the world's largest collection of over 1,700 Australian native birds and mammals in a lush bushland environment. As you	"Walk through Koala Sanctuary" there will be plenty of photo opportunities with these furry favourites. ➤ Capture an 'all important Roo selfie' in one of the walk-in enclosures whilst handfeeding Kangaroos, Wallabies and Pademelons. You will also get to observe numerous other 'Aussie' favourites such as Wombats, Tasmanian Devils, Echidnas, Emus, Penguins, Crocodiles and Dingos! ➤ Finish the day with a relaxing cruise down the Parramatta River and Sydney Harbour, enjoying the sunset.